Facts about Grey Seals. "Scientific name for Grey Seal Halichoerus grypus". The grey seal is a breed of seal that belongs to the large seal Phocidae family. The Grey Seals are largely found on either shore of the North Atlantic Ocean. This breed is the only variety classified in the Halichoerus class. "Scientific name for seals is Pinnipedia". Seals and sea lions and Walruses are semiaquatic mammals they are all in a group called pinnipeds, meaning "fin-footed". The Grey Seal appears with the body length, ranging from 8 1/4 to 10 7/8 feet (2.5 meters to 3.3 meters). The female Grey Seals are smaller than the males and have the body length, ranging from 5 1/4 to 6 1/2 feet (1.6 meters to 2.0 meters). The weight of the male Grey Seal breed ranges from 375 to 684 pounds (170 kg to 310 kg), whereas the females have a body weight ranging from 220 to 419 pounds (100 kg 190 kg). The grey seal breed appears with a straight head, nostrils set well separated and less spots on its body. 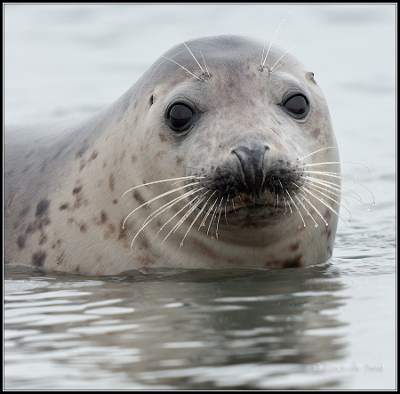 The Grey Seals have smaller noses and a more curved profile than other varieties of seals. Usually, male Grey Seals are darker than the female ones, with more glowing patches and regularly scarring about the neck. Female Grey Seals appear with the silver grey to brown body with dark patches. The grey seal breed feeds on an extensive variety of fish, generally demersal or benthic species and sand eels. Sometimes the Grey Seals consume whatever is accessible, including lobsters and octopus. The grey seal breeds congregate in huge groups to mate, with male seals contending with each other to get the access to female seals. Land reproduction gray seals are habitually polygynous, which means that one male seal will potentially mate with a maximum of 10 female seals in the reproduction season. The pups of the grey seal breed are born between September and November with a thick, malleable silky white hair and they quickly fatten up on the fat-rich milk of their mother. Within a month of their birth, the Grey Seal pups start shedding their fur, and grow thick water-resistant mature fur, and depart for the ocean to learn to find food for them. The average lifespan of the grey seal breed ranges from 25 years to 35 years.